Since I do not really know soccer very well, I had to look up who Eric Cantona was. Apparently, he is one of the greatest football players of all time, and played for the France national team, as well as Manchester United. Perhaps his most famous moment came when he drop kicked a opposing team's fan in the stands after being ejected. He has never felt any remorse about doing it. If only soccer were that awesome all the time. Anyways, onto this game. I previously had tried FIFA Soccer 96, and I must say I enjoyed this game more. It has faster gameplay and easier controls, despite being made in 1993. It also isn't impossible to score, so having a scoreless tie is less likely. Passing and shooting work fairly well, and when you don't have the ball, it always automatically switches to the closest player to the ball. It is also relatively easy to slide in and steal the ball (and get fouls!). One thing that is frustrating is goalie kicks - they seem to kick to the same spot all the time, so it is a matter of luck to get the ball. There are several tournament modes, and the option to have indoor soccer matches to change things up. 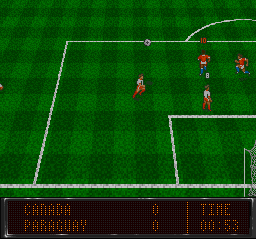 The graphics in this game certainly aren't spectacular, though no worse than the aforementioned FIFA Soccer 96. The graphics utilize a angled overhead view using Mode 7. Sounds are pretty minimal, but I guess are comparable with other sports games for the Super NES. However, in terms of speed, this game has it. The players glide around the screen very quickly, making this a fast paced soccer game. Probably the biggest problem with the game is the AI. During indoor soccer matches, for instance, the computer player will always run to the same place when approaching the net. This leads to an almost hilarious back and forth in the demo sequences, but it pretty annoying during actual matches. The goalie will always take the ball to the same spot, and always kick to the same place. This probably isn't an issue with multiplayer, but since I have no one to play with, that is kind of a moot point.